Wash eggplant and cut it into around 1/2 inch round slices. 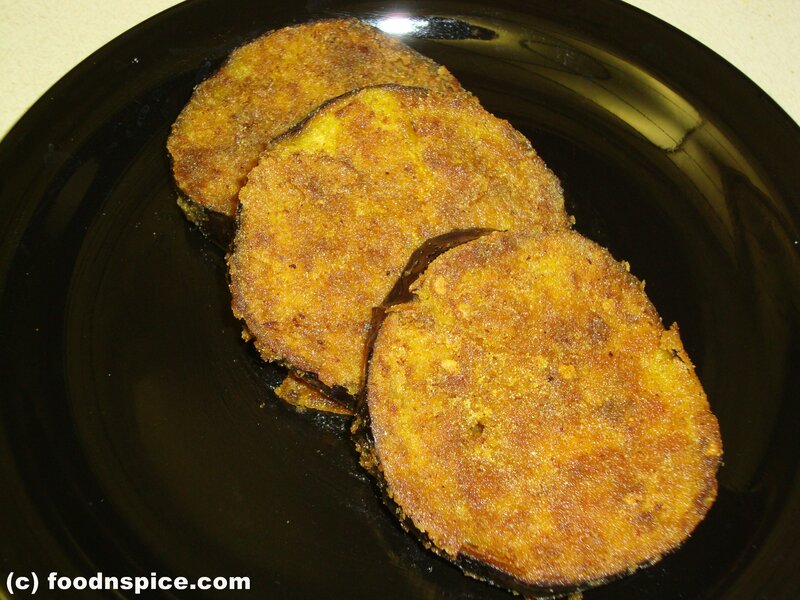 Sprinkle salt on the eggplant slices, and keep aside for 5 minutes. In a mixing bowl, add turmeric, 2 tsp red chilli powder, cumin powder, coriander powder, 2 tsp curry powder, 1 tsp oil & 2 tsp water. Mix well to form a thick paste. Add the eggplant slices in the mixing bowl and coat the slices well with the paste. Keep it covered for about 15 – 20 minutes. Mix semolina, rice flour, chick pea flour in flat dish.To this mixture, add salt, 1 tsp red chili powder, 1 tsp curry powder and mix well. Coat the marinated eggplant slices (both sides) in the flour mixture. Heat about 2 tbsp oil in a pan and place 2-3 slices, depending on the size of the pan. Drizzle some more oil round the slices.Lower the heat to medium and close the pan with a lid. After 2-3 mins, turn the slices upside down and cover with lid again. Continue to cook till the brinjals are cooked completely and the outer flour coating is crispy. Serve hot with steamed rice and daal.